Most consumer tool chests have pull-type tool chest handles. Of course, the main purpose of these handles is to facilitate carrying and opening of the tool chest, but these handles play even more important roles than may first be perceived. In many cases, tool chest handles must support the entire weight of the tools inside. They are expected to provide years of service. And they need to feel comfortable for the user. Many consumers will judge the entire quality of the tool chest based on how the handle is manufactured. Higher quality tool chest handles are expected to both look and feel good. A fine handle finish can even help brand a toolbox. Selecting the right manufacturing process for a tool chest handle can therefore have a significant impact on the success of the product. Both consumers and professional contractors have more choices than ever when it comes to ways to carry and store their tools. Although styles, options, and features have changed through the years, most can still be categorized into four styles. These are the most popular category for consumers and do-it-yourselfers and are often designed with a relatively large single handle on the top lid of the box. This handle must support the entire weight of the box and tools put inside it. 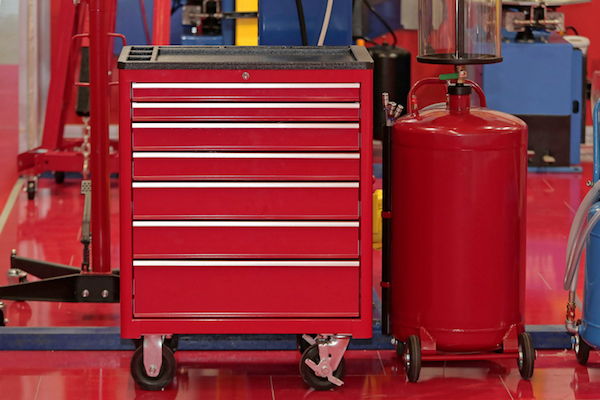 Recently, tool bags have become increasingly popular but the standard hand-carried metal toolbox is still the standard bearer in the segment. Rolling tool chests are designed to carry significant weight while being easier to move. This makes them a popular choice for contractors and workers who travel with their tools. Many have built-in wheels and others are built with a rolling dolly design. Tool cabinets use a combination of storage boxes and drawers to organize and store tools. They can be relatively small or extraordinarily massive in size and are often found in mechanic shops. Some larger units will even contain cabinet-style storage space for larger power tools. Tool storage workbenches combine the convenience of drawer and cabinet style storage space with a work surface. Many of these combination tool storage systems are designed on wheels to be more maneuverable. There are many options available for making tool chest handles. The chosen manufacturing method can make a big difference to the quality and perceived value of a tool chest. Tool boxes need to carry the weight of their contents without adding additional weight themselves. That’s why the high strength-to-weight ratio of tubular hydroforming is a valuable option for producing tool chest handles. Besides offering exceptional strength without any unnecessary weight, there are other benefits to tubular hydroforming relevant to tool chest handles. Additionally, hydroformed toolbox handles can be created without seams, offering an exceptionally attractive finished appearance. Roll forming, or cold roll forming, starts when a long strip of coiled metal passes through a series of incremental bends. This process continues until a final cross-section profile is achieved. Features like curves and additional in-line bends can then be added without significant changes to the metal thickness. Roll forming can be extremely efficient and cost-effective thanks to the implementation of in-line process that minimize part handling and reduce customer costs. Tube or tubular stamping is a relatively new metal fabrication process that offers design advantages, high strength-to-weight ratios, and significantly lower manufacturing costs than screw-machined parts, die casting, and aluminum extrusions. Tube stamping also supports the production of tool chest handles with special design features — without adding additional machining costs. More complex and varied tubular shapes such as round, oval, square, etc. With the proper volume, tube stamping can be a cost-effective way to get heavy-duty tool chest handles with high-quality finishes. At Mills Products, we specialize in manufacturing a variety of handles for various market segments, including the appliance, automotive, heavy truck, and furniture industries. We specialize in taking initial designs and helping to transform them into the most manufacturable designs possible, saving OEMs and suppliers time and money while preserving initial design intent. To learn more about how we do this — and how Mills can deliver high-quality tool chest handles that suit your needs — please contact us.